These words made me stop and think. As they sunk in, they made me commit. I committed myself to the idea that the Internet is a global public resource that we all share and rely on, like water. I committed myself to stewarding and protecting this important resource. I committed myself to making the importance of the open Internet widely known. When we say, “Protect the Internet,” we are not talking about boosting Wi-fi so people can play “Candy Crush” on the subway. That’s just bottled water, and it will very likely exist with or without us. 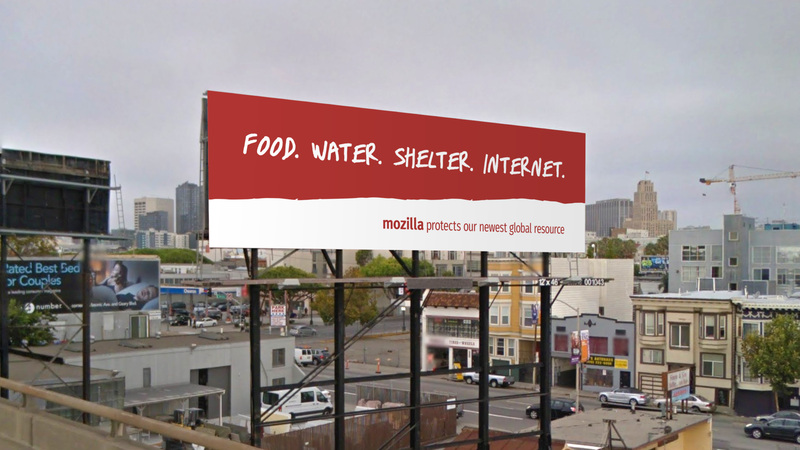 At Mozilla, we are talking about “the Internet” as a vast and healthy ocean. We believe the health of the Internet is an important issue that has a huge impact on our society. An open Internet—one with no blocking, throttling, or paid prioritization—allows individuals to build and develop whatever they can dream up, without a huge amount of money or asking permission. It’s a safe place where people can learn, play and unlock new opportunities. These things are possible because the Internet is an open public resource that belongs to all of us. Not everyone agrees that the health of the Internet is a major priority. People think about the Internet mostly as a “thing” other things connect to. They don’t see the throttling or the censorship or the surveillance that are starting to become pervasive. Nor do they see how unequal the benefits of the Internet have become as it spreads across the globe. Mozilla aims to make the health of the Internet a mainstream issue, like the environment. Consider the parallels with the environmental movement for a moment. In the 1950s, only a few outdoor enthusiasts and scientists were talking about the fragility of the environment. Most people took clean air and clean water for granted. Today, most of know we should recycle and turn out the lights. Our governments monitor and regulate polluters. And companies provide us with a myriad of green product offerings—from organic food to electric cars. But this change didn’t happen on its own. It took decades of hard work by environmental activists before governments, companies and the general public took the health of the environment seriously as an issue. This hard work paid off. It made the environment a mainstream issue and got us all looking for ways to keep it healthy. When in comes to the health of the Internet, it’s like we’re back in the 1950s. A number of us have been talking about the Internet’s fragile state for decades—Mozilla, the EFF, Snowden, Access, the ACLU, and many more. All of us can tell a clear story of why the open Internet matters and what the threats are. Yet we are a long way from making the Internet’s health a mainstream concern. We think we need to change this, so much so that it’s now one of Mozilla’s explicit goals. 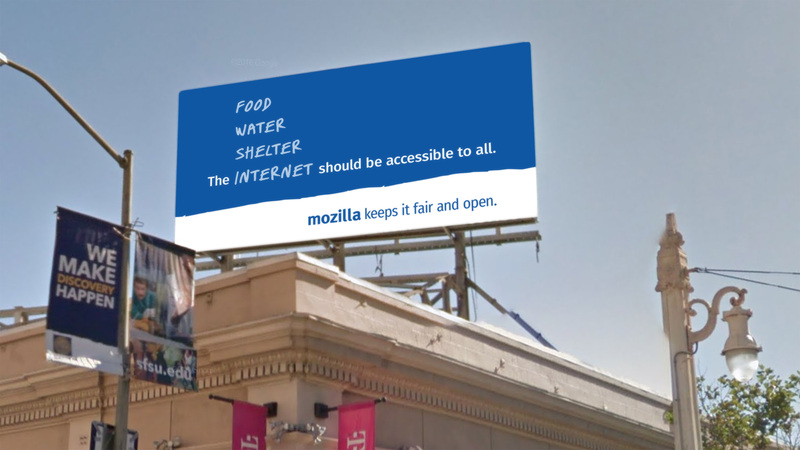 Read Mark Surman’s “Mozilla Foundation 2020 Strategy” blog post. The World Bank’s recently released “2016 World Development Report” shows that we’re making steps in the right direction. Past editions have focused on major issues like “jobs.” This year the report focuses directly on “digital dividends” and the open Internet. We need this vigorous debate. A debate like this can help make the open Internet an issue that is taken seriously. It can shape the issue. It can put it on the radar of governments, corporate leaders and the media. A debate like this is essential. Mozilla plans to participate and fuel this debate. Of course, we believe the conversation needs to be much broader than just those who read the “World Development Report.” If we want the open Internet to become a mainstream issue, we need to involve everyone who uses it. We have a number of plans in the works to do exactly this. They include collaboration with the likes of the World Bank, as well as our allies in the open Internet movement. They also include a number of experiments in a.) simplifying the “Internet as a public resource” message and b.) seeing how it impacts the debate. Our first experiment is an advertising campaign that places the Internet in a category with other human needs people already recognize: Food. Water. Shelter. Internet. Most people don’t think about the Internet this way. We want to see what happens when we invite them to do so. The outdoor campaign launches this week in San Francisco, Washington and New York. We’re also running variations of the message through our social platforms. We’ll monitor reactions to see what it sparks. And we will invite conversation in our Mozilla social channels (Facebook & Twitter). Of course, billboards don’t make a movement. That’s not our thinking at all. But we do think experiments and debates matter. Our messages may hit the mark with people and resonate, or it may tick them off. But our goal is to start a conversation about the health of the Internet and the idea that it’s a global resource that needs protecting. Importantly, this is one experiment among many. We’re working to bolster the open Internet movement and take it mainstream. 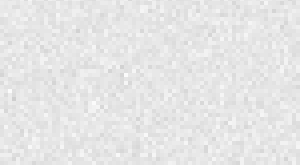 We’re building easy encryption technology with the EFF (Let’s Encrypt). We’re trying to make online conversation more inclusive and open with The New York Times and The Washington Post (Coral Project). And we’re placing fellows and working on open Internet campaigns with organizations like the ACLU, Amnesty International, and Freedom of the Press Foundation (Open Web Fellows Program). The idea is to push the debate on many fronts. Has the time come for the Internet to become a mainstream concern? Does it rank with other primary human needs? I’m hoping it does, but I’m also ready to learn from whatever the results may tell us. Like any important issue, keeping the Internet healthy and open won’t happen by itself. And waiting for it to happen by itself is not an option. We need a movement to make it happen. We need you. What about a hashtag for the movement as we go mainstream? I couldn’t agree more. I will work on gettimg this message out in my community. The internet is a vital resource for education and growth. You could argue that the internet is accelerating evolution. I plan to. billboard open to talk about money for food shelther water.it still time to do some thing all it can be done .we need to sale thing .also.need to think about people can buy or dont want buy. Shortly, to me, the Internet is critical regarding humans rights more than humans needs. It can have an impact on the balance of a system we are part of, and drastically change the system’s rules. Due to the recent demand by the Federal Judge for Apple to accommodate the FBI on a cell phone used by San Bernadino terrorists I feel privacy is #1of the utmost and the government has no business into our privacy. As of today there was a fellow cyber expert willing to hack the Iphone and that should be the end of the story. However the government once again wants to intrude in our private lives and I’m fully against that. Please Please stick to your guns as well, because it will affect all of our privacy. Part of our Bill of Rights included a person has a right to be secure in their papers. I feel our use of the internet now takes the place of our papers to a large extent. Some people talk to to their most personal friends, about personal matters that were once put only in the mail for delivery. Now it goes everywhere, and everyone may have access to it. Our privacy apparently no longer exists. If one person breaks the law and abuses the air waves, it becomes an excuse to deprive basic privacy rights to everyone. Our governments cannot be trusted to use our information, any more than our enemies. Everything said is just a matter of interpretation and can be taken in many ways. Paranoid minds in government power positions can utilize and misinterpret every, and any statement made by just about everyone to reach any outrageous objective they chose. Innocence is a matter of interpretation not reality. Abuse of Power is never a suprise anymore, it is a daily fact of life. The Internet just gives Powerful People a new toy to abuse others with. Our governments cannot be trusted to use our information, any more than our enemies. I agree with the idea expressed in the article. Internet is now a fundamental part of our company, present in almost every moment of our lives and contributes significantly in the growth of new generations, and as an integral part of our social environment is good that remains untouched and open to all.